My 4-year-old is chatty. And while he will occasionally talk to himself, he’d much rather talk to you. And to him nothing is more frustrating than not being understood. So, he’s realized that he needs detail. Words like “lots” or “just a little” or “soon” are easily misunderstood. Like when Dad says, “Hang on, dinner will be ready soon.” He’d prefer to have a better understanding of whether you mean 30-seconds soon or 10-minutes soon. The math teachers among us see this as adding units to your answer. We ask our students, “What was the final speed of the car?” We don’t expect them to say, “fast.” We’d prefer something like “54 m/s”. So would my 4-year-old. “Soon” is too loose a word. Except, most of the typical units don’t mean anything to him because he is still developing his understanding of what “a mile” is. First, that it’s a unit of distance. Second, how far is one of those. These two things are essential to making meaning out of a statement like, “Well, the store is 6 miles from here.” Without those, statements like “This box is heavy. It’s, like, 6 miles!” are not uncommon around my house right now. Did you catch that? There was a step forward in that. He knew the number wasn’t enough. “Put two in there” is really easily misunderstood. That would be a problem. Two of what? Finally, he figured out that this thing had a name. That I knew it. That he needed to know it and that it wouldn’t work to make it up. If he is going to communicate this amount to others, he needed to know the ACTUAL name of this scooper. Not his preferred name. There you have it. Math talk by necessity. Lends credence to the notion that if you put students in rich enough environments, you won’t have to mandate good math talk. They simply won’t be able to communicate effectively without it. I am often not on the intellectual cutting edge. Pretty much any idea that I’ve had, someone else has had before. Usually lots of people, actually. This discussion of growth mindset is no different. The Atlantic (specifically Christine Gross-Loh) and the Harvard Business Review (written by Growth Mindset author Carol Dweck) beat me to this one. And that’s okay. They have folks whose job it is to write. I do this as a hobby. I’m just grateful for their shoulders to stand on. Growth Mindset is becoming a fad. Of course, Dr. Carol Dweck (who is responsible for coining the term and the supporting research) understands this better than anyone. What will happen to the term “growth mindset” when it gets unleashed on the public and Twitter gets a hold of it? Well, certainly the nuance is gone. The public arena (and it’s right arm: social media) tends to treat nuanced arguments like they belong on a dollar-store clearance rack. 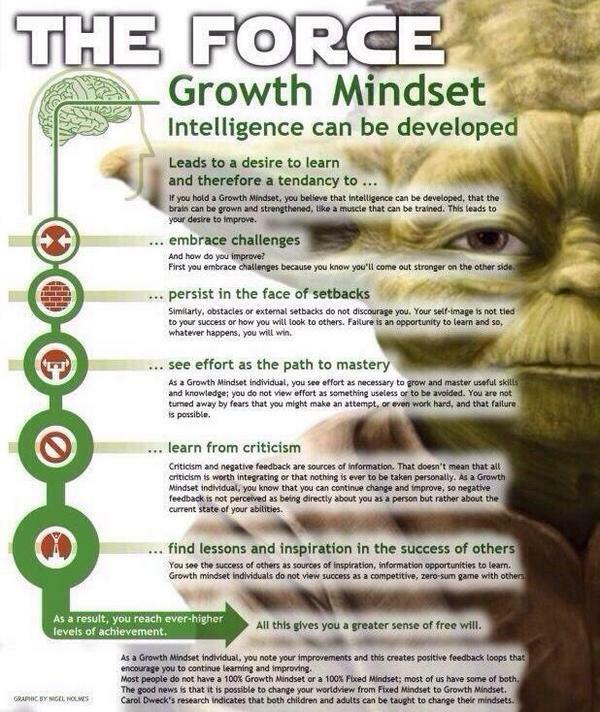 So, at the very least, you can count on growth mindset being over-simplified (probably quite significantly at that). With over simplification comes the inevitable misunderstanding. If all you know about this idea a series of talking points laid out 140-characters at a time, the chances of you missing an essential component are quite good. Of course accidental misunderstanding is independent to one’s confidence to propagate their (mis)understandings on the topic. And of course, researchers have a love-hate relationship with this phenomena. On one hand, they are getting often getting criticized for statements made by people who don’t really understand the actual point they are making. Not fair, but common. (Ask our Lord Jesus Christ, Charles Darwin, Martin Luther…). 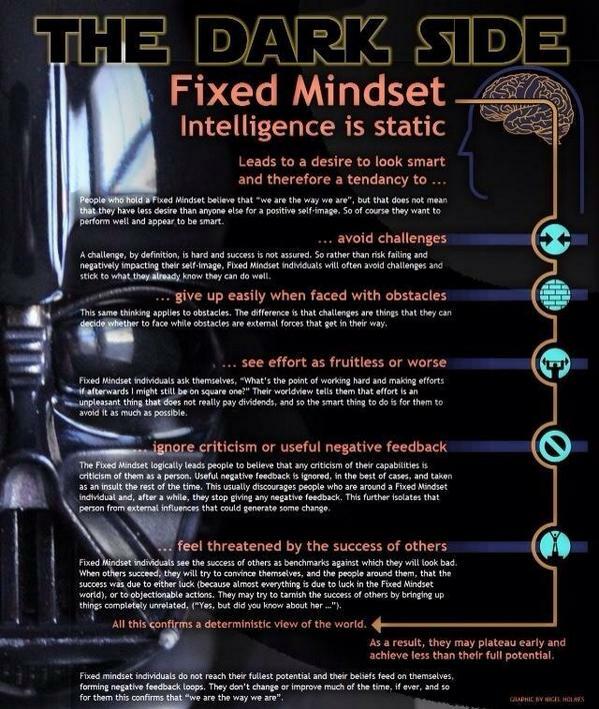 And of course, this explains why growth mindset is talked about with such a wide range of implications. Sometimes, it takes more than Yoda and Darth Vader posters to explain complex topics… particularly topics wrapped around the way an individual sees the world around them. As with most things, in order to experience the full benefit, there needs to be fidelity with the implementation. Otherwise, what gets left out might be the thing that makes it effective. But Dweck recently noticed a trend: a widespread embrace of what she refers to as “false growth mindset”—a misunderstanding of the idea’s core message. Growth mindset’s popularity was leading some educators to believe that it was simpler than it was, that it was only about putting forth effort or that a teacher could foster growth mindset merely by telling kids to try hard. A teacher might applaud a child for making an effort on a science test even if he’d failed it, for instance, believing that doing so would promote growth mindset in that student regardless of the outcome. another misunderstanding [of growth mindset] that might apply to lower-achieving children is the oversimplification of growth mindset into just [being about] effort. Teachers were just praising effort that was not effective, saying “Wow, you tried really hard!” But students know that if they didn’t make progress and you’re praising them, it’s a consolation prize. They also know you think they can’t do any better. It involves really understanding our own inner balance of fixed and growth mindsets. Growth mindset isn’t the easiest way. It’s the most valuable way. Are you sure you really want a growth mindset? Remember, thinking you’ve maxed out your ability provides a neat little excuse to only “do your best” as opposed to what WMU football coach PJ Fleck regularly calls “changing your best.” And even if you are convinced in the value of growth mindset, you still have to convince your students. Finally we talked about why someone would want a growth mindset. We realized that some kids would be overjoyed to hear you can develop your intellectual abilities, but others might not think it was the most exciting thing. So we then had a whole section on why you might want to develop your mind. Teenagers are really excited about the idea that they can do something to make the world a better place. So we asked them what they want to make their contribution to in the future—family, community, or societal problems—and then talked about how having a strong mind could help them make their future contribution. Nestled deep within growth mindset is “growth”. Growth toward what? Well, certainly away from what we currently are (because it’s not good enough yet) toward something else (presumably something better.) This mindset is fundamentally at odds with a philosophy that says, “Don’t worry. You’re perfect just the way you are.” If that were true, why would we need growth? Why are we trying like crazy to help our students “grow”? Why should we be trying like crazy to model that in ourselves? Certainly because we’re not all “perfect just the way we are.” In fact, in a time of struggle, it might be more helpful to be told, “perfect or not, you’re not stuck the way you are. You can be more. I’ll help you. And if you try for it, your effort will be rewarded.” That’s what growth mindset brings to the table.